Automatic sprinkler systems are very popular nowadays but there are quite a few people that do without such a convenience. Some people water their lawn manually with a hose faucet watering system, which isn't so bad if you've got an Orbit 91213 one dial garden hose digital water timer. And some people don't care enough to water their lawn at all. Perhaps you are considering a change. You want to make the switch to Automatic Water Sprinklers? In this post we will go over some things to consider before installing an automatic sprinkler system. It takes approximately 27,154 gallons of water to apply one inch of water to one acre of land. Before you decide to go with automatic sprinklers, bear in mind that the demand for water is high. 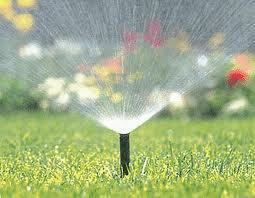 In order to get the most out of your sprinklers you are going to have to pay the price for water. Not only that, installing an underground, automatic sprinkler system is expensive. Even if you do it yourself, you will be spending a pretty penny. You can probably cost the price in half, if not more, by doing it yourself but it is recommended that you let a trained professional install it for you. Every landscape is different. You are going to have to figure out if you can divide you yard or yards into zones. Of course, it's possible, but some lawns are trickier than others. Don't forget to consider the side lawn, if you have one. Are you going to need 3 or even 4 separate systems? 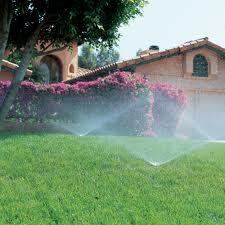 Automatic sprinkler systems require time and maintenance. You are going to need to equip yourself with the proper tools and knowledge. Spare sprinkler bodies: You should normally keep some extra sprinkler bodies that resemble the product that was installed with your system. Having identical sprinkler bodies will keep replacement and repairs simple. A handful of various Orbit sprinkler nozzles: Even though there may be several types of sprinkler heads (pop up, rotary or impact), it is important to have extra copies of the same nozzle that are being used in the various zones. Even though many home centers prefer to sell you the sprinkler body with the nozzle, having them as separate items will save you time and money. Sharpshooter Shovel: This particular shovel works well when working on sprinklers as you can dig around a sprinkler without disturbing too much dirt. Dirt and dirty water is the enemy when it comes to working on sprinkler systems. Screwdrivers: 1 small screw driver, 1 medium screw driver (flat and Phillips head style). These will be used to disassemble nozzles and some heads. 1 pair of medium-sized Channel Lock pliers: These can be used to adjust, tighten and loosen the body of the sprinkler head especially if your hands are wet. 1 pair of medium-sized vise grips: Used as a way to extract nozzles from pop-up heads by lightly holding the nozzle riser exposed. Never use a lot of pressure as you can easily damage the sprinkler head. If you have a professional install your system for you, they will most likely throw in a sprinkler timer. The amount of zones your landscape calls for will determine what kind of timer you get. However, you should look into timers yourself and find one that you like. 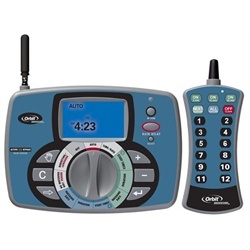 Find an Orbit timer that is simple to use and install. Sprinklersystemstore.com has a lot of great choices. You will also want to consider external sensors like rain and freeze sensors. If you live in a place that gets really cold or a lot of rain, you will want to invest in a sensor that will shut off your sprinklers when they are not needed to save you money and to prevent the sprinkler pipes from freezing. If you have a garden or flower bed, you will want to consider installing a drip irrigation system. They are easy to install and are extremely beneficial. They too can be run from your automatic sprinkler timer so you don't have to worry about watering them or turning the water on or off. A convenience you will never be able to live without again. Automatic sprinkler systems can be rewarding but you should not plan on having one installed without doing some careful planning. Take some time to budget your financial situation to make sure you can afford it. Get involved in some online lawn care communities to become familiar with how sprinkler systems work so that you don't have to pay a maintenance man to come out and fix every little thing for you whenever something goes wrong.